One of the more endearing moments of 2010's Classic Rock Awards came when Exile On Main Street won Reissue Of The Year. Enter Stones guitarist Ronnie Wood to accept. Never mind that Wood never actually riffed on the band's original 1972 masterwork. "I've played these songs for the last 30 years and it's about time that I collected something," he said. "So thanks a lot!" It’s in Life, Keith’s recent autobiography, where the double strands of the Taylor effect are most tellingly articulated, if a little sourly. Richards admits he was sometimes in awe of Taylor’s playing - “the melodic touch, a beautiful sustain and a way of reading a song” - but also calls him shy to the point of being “very distant”. There’s a distinct tang of bitterness when Richards claims his departure “left us in the lurch”, more so when he delights that, post-Stones, Taylor “didn’t do anything”. Which just isn’t true. Taylor teamed up with Jack Bruce, toured and played with Bob Dylan and other notables like Alvin Lee, Little Feat and the Grateful Dead, made solo records and even reunited with mentor John Mayall in the Bluesbreakers. But you can see Keith’s point. Pine box or not, there’s no getting away from the Stones. I was earmarked to accompany Taylor to the Classic Rock bash at the Roundhouse, the idea being for him and Ronnie to collect the award together. Old chums reunited and all that. But some tricksy dental surgery had apparently left him with a badly swollen face and no voice, forcing him to stay home. Perhaps fitting, some might venture, for a man often regarded in hindsight as the enigma that even the Stones couldn’t crack. That said, the Mick Taylor who answered the phone to Classic Rock a few days earlier is talkative, if guarded. What does he recall of those heady days in the South of France in 1971, recording Exile On Main St at Nellcôte, Keith’s waterfront pile? It may have been all coke, cognac and Cote d’Azur upstairs, but what about down in the basement, where all the work was done? The Stones had initially decamped to France as tax exiles. And while Jagger settled in Paris with new bride Bianca, the others found places in the hills surrounding Nellcôte. John Mayall’s Bluesbreakers had been Taylor’s first professional calling in 1966, when the 17-year-old replaced the Fleetwood Mac-bound Peter Green. Taylor developed into a formidable guitarist under Mayall’s tutelage. In June 69, Mick Jagger was casting for a replacement for Brian Jones, and asked Mayall for advice. Mayall recommended Taylor. “Live With Me was the very first track I ever played on,” Taylor recalls, “when they were putting the finishing touches to Let It Bleed. We actually recorded that the night I went for my audition at Olympic Studios, or maybe the night after. "Then I overdubbed guitar on Honky Tonk Women. But Live With Me was special, because it was the first Stones song I ever played on. I remember [producer] Jimmy Miller jumping up and down in the control room and getting all excited about how good it sounded, having two guitars playing off each other. Because I think they’d missed that with Brian Jones in the two-year hiatus since their last live performance. The Stones actually hadn’t played together for a long time, so when I joined them it was like a new beginning. It was a new phase in their career, a new chapter. If anything, Taylor’s fondest Stones memories are reserved for Sticky Fingers, the album they made in London (and, for a few days, in Muscle Shoals, Alabama) the previous year. “Unlike Exile On Main St, we didn’t labour over it day and night, month after month. 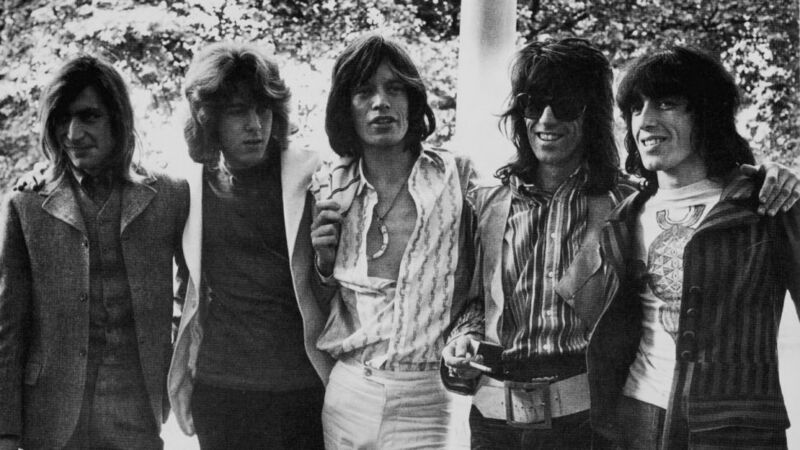 Most of it was done in the studio, though some of it was done at Jagger’s house, Stargroves in Berkshire.” It’s generally acknowledged that Taylor’s creative input came to bear on two Sticky Fingers songs – Sway and Moonlight Mile. Again, he chooses his words prudently. “I had an influence on them. I mean, would Sway have existed without my contribution? Probably, but not the way it does. And the same goes for Moonlight Mile. I remember Mick writing that one in a train carriage on the way from Paddington to Bath. Touring in those days, even with the Stones, was often like that. We didn’t have private planes or trains. But there was more required of a Stone than mere musicianship. You needed a strong backbone to survive life on the road with the world’s biggest band. If Taylor’s Hyde Park baptism wasn’t testing enough, five months later came Altamont. The disastrous free concert near San Francisco was marred by violent clashes between Hells Angels and the crowd, ending in the horrific murder of Meredith Hunter, captured on film by the Maysles brothers in Gimme Shelter. “Altamont all happened so quickly,” recalls Taylor. “It was very surreal, a nightmare actually. The whole idea of doing a show at Altamont Speedway was an afterthought. We’d finished the tour and were at Muscle Shoals in Alabama, recording Wild Horses and Brown Sugar. Then there was the recreational side of being a Stone, including the band’s much-publicised drug use. Did that hamper things somehow? “I don’t know, maybe it even helped in some ways. It’s a strange thing to say, but it was just a part of so many people’s lives who used to hang out with the Stones, even from the early days. It wasn’t something I ever felt was unique to them though. It was part and parcel of the recreational drug-cultural view of life. I’m not saying it wasn’t dangerous, but it didn’t have the sinister, nasty qualities that are associated with it these days. So there you have it, for today at least. Taylor insists his time with the Stones was a great experience, with Exile On Main St particularly fresh in the mind. For 2010’s deluxe reissue, he added a new guitar part to one of the bonus songs, Plundered My Soul.